An operational amplifier (or an op-amp) is an integrated circuit (IC) that operates as a voltage amplifier. An op-amp has a differential input. That is, it has two inputs of opposite polarity. An op-amp has a single output and a very high gain, which means that the output signal is much higher than input signal. 1. Opamp has high input impedance & low output impedance. 2. Zero common mode gain or infinite common mode rejection. 3. Infinite open loop gain AOL. ** opamp is used as differentiator, integrator, comparator, current – voltage converter, voltage- current converter, etc. 2. Resistance- 10K, 470 ohms(2), 2K pot. Theory: This project uses IC LM35 as a sensor for detecting accurate centigrade temperature. Linearity defines how well over a range of temperature a sensor’s output consistently changes. Unlike thermistor, linearity of a precision IC Sensors are very good of 0.5°C accuracy and has wide temperature range. It’s output voltage is linearly proportional to the Celsius (Centigrade) temperature. The LM35 is rated to operate over a -55° to +150°C temperature range. It draws only 60 µA from its supply, it has very low self-heating, less than 0.1 °C in still air. 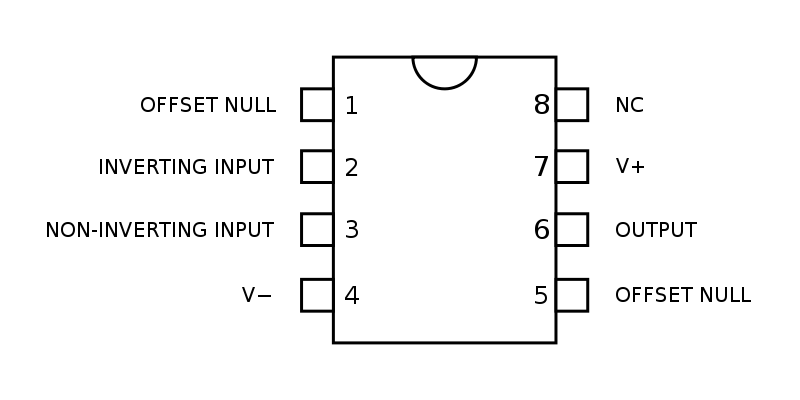 LM35 Operates from 4 to 30 volts. 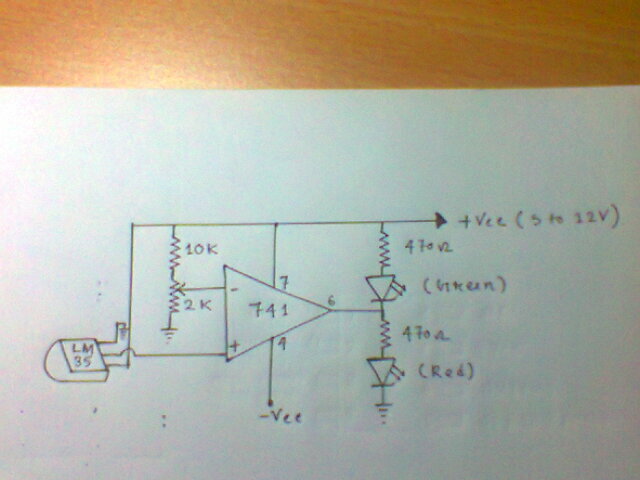 Output of IC is 10mv/degree centigrade. 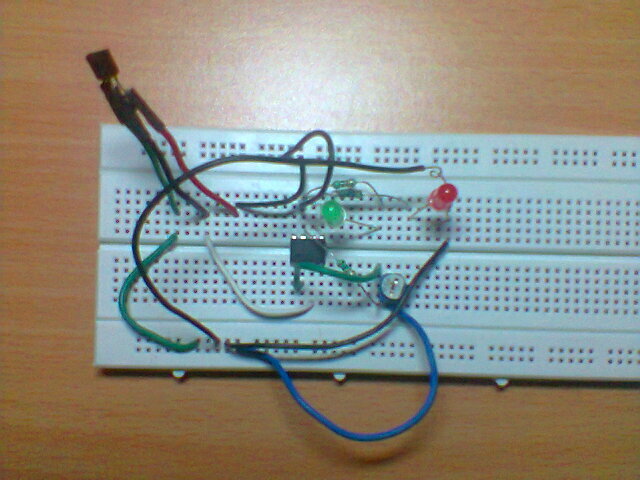 For example if the output of sensor is 280 mV then temperature is 28 °C. So by using a Digital multimeter we can easily calculate the degree temperature. For trigger point you should set the voltage of pin 2 of IC 741 by using preset or potentiometer. Our aim of this project is not to construct a thermometer but to activate or deactivate a device at a particular margin temperature. For simplicity we have used 2 LEDs for indication of both low (Green) and high (Red) temperature.